Ok, so which is it, creation or evolution? Did God create the heavens and the earth, and all life, as we know it today? Or…did the all the galaxies including every known and undiscovered life form come into existence through a series of random, fluke accidents? God created the heavens and the earth, including all life. God created each species after it’s own kind, as fully formed species. Living creatures can physically change to adapt to their environments this process is known as natural selection. God started life as simple single celled organisms, then went home and let evolution take over from there. That’s what many misguided Christians believe happened. Even though Bible-believing Christians obviously don’t ascribe to evolution, they do understand why non-believers do. Our liberal school systems have pounded evolution into our heads for many years. Hey, it must be credible because there are scores of scientific volumes, which clearly espouse it. They even depict the many stages of evolutionary changes. Haven’t you seen the detailed drawings, charts and models of half fish - half lizard? It doesn’t matter to the evolutionary scientists that these types of creatures have never been found in any fossil specimen, we know they existed because they don’t believe in God! 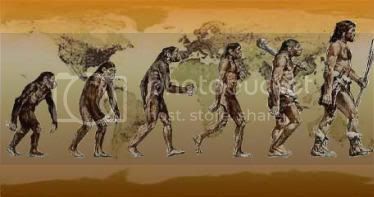 How about the evolution of humans? Judging by these kind of detailed charts, you would have to assume the scientists have found many series of graduated transitional fossils which chart the evolutionary changes from monkeys to chimpanzees to apes to “cave men” and right up to modern man…right? WRONG! Well, if they haven’t found “many” G.T.F. then surely they have found a few…right? WRONG! OK, then they found one series, which connected the evolution of man from monkey, that’s obvious…right? NOPE! Then it’s obvious that they found some partial G.T.F…right? The fact of the matter is, that there is nowhere on this entire planet, even a single example of a G.T.F. to be found! Not one! Evolutionists will tell you that there are G.T.F., however, when asked to point them out, they go into a coma, and usually stammer on about the “evidence” for evolution, such as the peppered moth and the wingless beetle (I’ll discuss these examples shortly), hoping you will forget that you asked for examples of G.T.F. Prior to the industrial revolution in England, the peppered moth population consisted predominantly of light-colored moths (containing speckled dots). A dark-colored form comprised only a small minority of the population. This was so because predators (birds) could more easily detect the dark-colored moths as they rested during the day on light-colored tree trunks. With the onset of the industrial revolution and resultant air pollution, the tree trunks and rocks became progressively darker. As a consequence, the dark-colored moths became increasingly difficult to detect, while the light-colored form ultimately became easy prey. Birds, therefore, began eating more light-colored than dark-colored moths, and today over 95 percent of the peppered moths in the industrial areas of England are of the darker-colored variety. In this example, it is obvious that “natural selection” only changed the ratios of black and light (peppered) forms. Yet today many museums and educational institutes worldwide use this as one of the most striking examples of "evolution" ever witnessed by mankind. Today, there are a small handful of cases in which a genetic mutation has helped a creature to survive better than those without it. These types of mutations are referred to as “beneficial mutations” But even these beneficial mutations do not improve the code in DNA: rather than adding any meaningful information, they destroy it. For example, Darwin pointed to a case in which a genetic mutation caused flying beetles on a small desert island to lose their wings (the “wing making” information in the DNA was lost or scrambled in some way). However, due to this loss, the beetles had a better chance of survival because they were less likely to be blown into the sea. Thus, the mutation was “beneficial” to the beetle population because it helped them to survive better in their environment. This clearly shows how even a “beneficial” mutation can be damaging to the DNA code; in this case the mutation involved a loss of corruption of the information (or genes) for making wings. Textbooks regularly use examples of beneficial mutations as evidence for evolution. But the problem with using beneficial mutations to support evolution is that they are exactly the opposite of what is required, that is, they involve a loss or corruption of existing information. For instance, losing the ability to fly has nothing to do with the origins of flight in the first place, which is what evolution is supposed to be about. To produce a beetle from a simple cell, it is obvious that an increase of new genetic information is necessary to create the eyes, the wings, etc. Thus, to support evolution, the preceding beetle example would have to be reversed. The DNA code would have to be improved rather than damaged — new meaningful information (genes) would have to be produced. This means that a new physical feature would have to arise that was never before present — beetles normally born without wings would subsequently have to be born with them. But no such example exists. Read through the Genesis account, and I'll point out some interesting facts at the end. Gen 1:7 And God made the firmament, and divided the waters which [were] under the firmament from the waters which [were] above the firmament: and it was so. Gen 1:9 And God said, Let the waters under the heaven be gathered together unto one place, and let the dry [land] appear: and it was so. Gen 1:10 And God called the dry [land] Earth; and the gathering together of the waters called he Seas: and God saw that [it was] good. Gen 1:11 And God said, Let the earth bring forth grass, the herb yielding seed, [and] the fruit tree yielding fruit after his kind, whose seed [is] in itself, upon the earth: and it was so. Gen 1:12 And the earth brought forth grass, [and] herb yielding seed after his kind, and the tree yielding fruit, whose seed [was] in itself, after his kind: and God saw that [it was] good. Gen 1:16 And God made two great lights; the greater light to rule the day, and the lesser light to rule the night: [he made] the stars also. Gen 1:18 And to rule over the day and over the night, and to divide the light from the darkness: and God saw that [it was] good. Consider the fact that Genesis was written down by Moses almost four thousand years ago. Remember, that was a very long time before science was even thought of, and yet, how amazing is it that even skeptical scientists have to concede that there is no scientific evidence in existence today to refute the Genesis account. Now that is either incredibly lucky, or the Bible is correct...We know the answer to that one don't we? Here's another thing to consider. God says He created the sun, the moon and the stars on the fourth day, and yet God created plants and trees on the third day. How long do you think plant-life would have lasted if God hadn't created the sun very soon afterward? Kind of puts the kibosh on those who don't believe in a literal seven day creation doesn't it? If creation took thousands or millions, even billions of years, how long would plants have lived without sunlight? Without plants nothing lives. God says He created life in seven days, and He obviously meant it. Why would the Bible be so specific about this? Why would the fact that God created each species after their own kind even be relevant thousands of years before the theory of evolution was ever thought of? That information would have been totally useless to mankind for thousands of years...right up until the ninteenth centurey A.D.
God exists in the past, present, and future simultaneously, and one of the miraculous things about His Word is that, it is, and was relevant throughout the ages. Evolutionists science tells us that life spontaniously generated, and that the earliest "simple" single celled organisms slowly "evolved" through a process known as macro evolution - one species gradually becomes a totally different species. This quantum leap is thought to be brought on by varried enviornmental conditions and changes which force macroevolution through natural selection. Macroevolution has never been observed, however, microevolution is seen to occur. Educated Christians have no problem with microevolution. Let's look at the difference between macro and micro evolution. Microevolution- this is when organisms adapt to the changing conditions of the environment. It improves existing genes. It does not create new genes. An example that illustrates this is the classic peppered moth argument. I'll recap the Peppered Moth; Basically, when the trees are white, there are more white moths, conversely when the trees were turned black by pollution at the turn of the century, more black moths survived simply from being harder to see, not changing into a different moth. The moths are still moths, not a new creature. Another example of microevolution which is posted on this thread, is the wingless beetle. Macroevolution-the changes within species that results in a new and separate species. An example of this would be a fish evolving into a bird. This has never been proven or observed in nature. Evolutionists like to play the shell game in regard to such theoretical changes. They will display a fossilized fish, then they will locate a fossil of a lizard, and finally, they will proudly hold up the latest "feathered lizard" fossil and profess to the unsuspecting world that this is proof of evolution! Never mind the fact that there is absolutely zero linkage between any of these fossils, this is typical of evolutionary science! 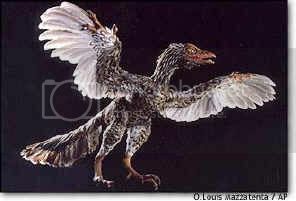 Oh ya, there's also the embarrassing fact that the so called "feathered lizard" was fake! I'll go into more detail about the "fakes" later on in the study. This shell game is to some extent a successful tactic for the evolutionary science world. This is the type of proof they use to show that there actually are graduated transitional fossils!! For the record, there are no actual graduated transitional fossils anywhere on this entire planet. I'll give an analogy of the G.T.F. problem. Imagine that there are ten photographs of ten different old men sitting on a table in front of you. Below those ten photos are ten other photos of ten different newborn children. You are asked to place the correct newborn photo with the matching old man photo. Pretty hard right? Now add into this task the fact that the newborn photos may or may not even be related to the old men in the photos. However, you are still required to complete the task. How would you accomplish this? You would have no other choice but to guess, using what you might perceive to be physical similarities. In the end, you would have no way of really knowing with any degree of certainty if you had found any real matches. Would you gamble your life that the matches were correct?...probably not, however, that is exactly what we do when we chose to believe in the theory of evolution over creation. If you given a full series of yearly photos from newborn to old age, you could with almost 100% certainty, make a determination of whether or not the newborn photos matched up with any of the old men in the photos or not. In the world of evolution, scientists insinuate, and some even outright lie, and tell us that there are fossils which at the farthest distant point of life, begin as one species, and through a graduated transitional series of fossilized "photos" one can with great certainty establish a pattern of evolution...this simply is not true. As a matter of fact, there is not, on the surface of this entire planet, so much as a single series of graduated transitional fossils, which show one species slowly or otherwise, change into another species. What we do find in the fossil record is fully formed specific species. There are no "half way" fossils...none! - zero! This fact is annoying evolutionary scientists to no end. As a mater of fact, the evolutionists scientists have had to revamp Darwinian evolution which says that species slowly mutate from one species into another, and the latest "theory" says the "change" happens so quick that there are no G.T.F.'s!! This is not science my friends, it's admission that evolution is a fraud! What scientist have done in essence, is to study baby photos and link them up to old men without any intermediary photos at all...a monkey has some physical similarities to humans, therefore we share a common ancestor - which, by the way, has never been found - but "it exists" if only in their minds. Before I get into DNA mutations, I think it's important to discuss biogenesis. The basis for evolution led to a revival of the spontaneous biogenesis theory, also known as chemical evolution, or spontaneous generation. Spontaneous generation is the hypothetical process by which living organisms develop from nonliving matter. However, this concept was disproved by Louis Pasteur, whose contributions were among the most valuable in the history of science. Pasteur proved through famous experiments that all life comes from life, never from non-life. There has never been a scientific experiment that has produced pure samples of the correct type of proteins or nucleotides necessary for the production of life. However, in 1953 the famous Miller/Urey experiment proved that in a hypothetical primordial atmosphere, ammonia, water, methane, and energy can combine to form some amino acids which are required for life. Yet the highly praised Miller/ Urey experiment did not produce any of the fundamental building blocks of life itself. It produced 85 percent tar, 13 percent carbolic acid, 1.05 percent glycine, 0.85 percent alanine, and trace amounts of other chemicals. Although the amino acids glycine and alanine are required for life, the tar and carbolic acids would be toxic to any proteins if they ever formed. Every subsequent experiment of this kind has produced similar results. Some experiments have produced slightly higher percentages of the usable product, but the majority of the material that is produced by these experiments is toxic to life. In fact, the Encyclopedia Britannica has affirmed in one article that modern findings “pose grave difficulties” for spontaneous generation theories supported by the famous Miller/ Urey experiment. Moreover, many scientists now believe that the earth’s early atmosphere would have made the synthesis of organic molecules virtually impossible in the Miller/Urey experiment. For example, NASA has reported that a “reducing atmosphere” has never existed, although the experiment assumes one. It is also now realized that the ultraviolet radiation from sunlight is destructive to any developing life. And there are many other specific criticisms of the Miller/Urey experiment as well that show its fundamental assumptions about the primordial atmosphere to be false. Despite the accumulating evidence that stacks up against the Miller/Urey experiment, it is nonetheless still used in educational institutes worldwide to support the idea that life was spontaneously produced from non-life. The theory of evolution says that a hypothetical first living cell evolved, over billions of years, into a human being. However, such a process meant finding a way to generate enormous amounts of genetic information (DNA), including the instructions for making eyes, nerves, skin, bones, muscle, blood, etc. If the theory of evolution were true then, the total information content of the genetic code (DNA) must have continually increased with the emergence of new genes (or instructions). There had to be some kind of mechanism to have added all the extra genetic instructions required to progressively transform a one-celled creature into a human being. Evolutionists believe it was something called genetic mutations. The English language can be used as an analogy to illustrate what a genetic mutation is: The message “The enemy is now attacking” could mistakenly be copied as “The enemy is not attacking.” Naturally, this mistake would probably result in harmful consequences. Indeed, it is unlikely that a random mistake might actually improve the meaning of the message; very likely the meaning would be damaged. In the same way, mutations are generally random copying mistakes in the reproduction of the genetic code (DNA), and tend to be harmful. The code in DNA is simply a complex set of instructions that tells a creature’s body how to reproduce itself (much the same as a set of instructions that tells a person how to reproduce a car or spaceship). Random copying mistakes (mutations), then, are obviously unlikely to improve these instructions;in fact, they are much more likely to damage or destroy them, as the Encyclopedia Britannica acknowledges. That is why many mutations cause disease and death. In fact, according to one university biology textbook, the odds that a mutation (random copying mistake) might actually improve the instructions contained in the genetic code are so low that “a random change is not likely to improve the genome (genetic code) any more than firing a gunshot blindly through the hood of a car is likely to improve engine performance.” But this isn’t surprising, since mutations are random mistakes. Evolutionists believe that over the last 4.5 billion years, an accumulation of trillions of these hypothetical “good” copying mistakes have continuously improved the genetic code, adding enough new information to transform a "simple" single celled organism into a human being. This is the equivalent of saying that random copying mistakes when re-typing the instructions to produce an automobile could eventually result in such an improved set of instructions, that instead of producing an automobile, the new and improved instructions would produce a working spaceship! Evolutionists believe that new DNA information (genes) comes from “good” accidental copying mistakes, and these mistakes are what have generated the encyclopedic amounts of information necessary to transform the first self-reproducing organism billions of years ago into every living thing in the world today. Put those "happy mistakes" together with a process called “natural selection,” and you get your “neo-Darwinian theory of evolution,” today the most widely believed explanation among evolutionists for life’s origins. Has a "good" mutation ever really been observed? has a mutation been observed which has been seen to improve the genetic code by adding meaningful information (new genes, or “instructions”) to build (at least part of ) a new physical feature? No! But that doesn't seem to bother the evolutionists. Let me briefly define what is meant by the term “information” in this context. The DNA code has already been defined as a set of instructions, analogous to an English message. The sequence of “letters” (or bases) in the code is not random or repetitive, but instead, like the letters in a written message. In other words, the code has meaning. For instance, a random sequence of English letters such as “nkntweioeimytnhatcesga” means nothing, but when the same letters are arranged “the enemy is now attacking,” it becomes a meaningful message, containing meaningful information. It is the specific arrangement of letters that makes the message meaningful to someone who understands the language, and this meaningful arrangement is, in itself, “information.” In the same way, it is the specific arrangement of “letters” (or bases) in the DNA code that makes the code meaningful to the body, which understands the DNA (genetic) language. This meaningful arrangement of “letters” in the DNA code is what makes up the information that tells the body how to produce a particular physical feature or characteristic, such as an eyeball or hair color. Today, there is a small handful of cases in which a genetic mutation has helped a creature to survive better than those without it. These types of mutations are referred to as “beneficial mutations.” But even these beneficial mutations do not improve the code in DNA: rather than adding any meaningful information, they destroy it. The examples I gave of the Peppered Moths and the Wingless Beetle are classic examples of these “beneficial mutations.” but let's be clear about this - these examples do not promote evolution - macro evolution requires new DNA information in order to grow hair, or limbs, or eyes ect. These examples are a direct result of a "loss" or "corruption" of existing DNA information. Textbooks regularly use examples of beneficial mutations as evidence for evolution. But again - the problem with using beneficial mutations to support evolution is that they are exactly the opposite of what is required, that is, they involve a loss or corruption of existing information. For instance, losing the ability to fly has nothing to do with the origins of flight in the first place, which is what evolution is supposed to be about. Is there ever an addition of new information? Well, if you look at textbook examples of evolution, there are none that cause an addition of new genetic (DNA) information. All appear to be downhill (information- losing) processes, the exact opposite of what evolution requires. Look at this illustration by creationist scientists of how genetic information is lost, rather than gained, as creatures adapt to their environment. While natural selection and beneficial mutations “may increase an organism’s adaptation,” no one has ever been able to point to a mutation that has actually improved the genetic code by adding new meaningful information (new genes or “instructions” for building a new physical trait). All mutations appear to scramble the already-existing information (instructions), either by the reshuffling or duplication of existing genes, or simply by damaging the genes altogether. But because examples such as the wingless beetles and the peppered moths show physical changes in living creatures, they are still repeatedly used by evolutionists to promote the idea that primitive bacteria have changed so much in the distant past that today they have become people. Yet such examples simply do not support evolution — all observed examples of change are either genetically neutral or genetically downhill, being losses of information instead of the required gains. Losing bits of genetic information a little at a time surely does not help explain how the genetic code was built in the first place; one can’t build a business by losing a little bit of money at a time. Today, there is a growing realization that the presently accepted concept of natural selection and mutations really explains nothing of evolutionary significance. One leading creationist summarized the situation well: “All of our realworld experience, especially in today’s ‘information age,’ would indicate that to rely on accidental copying mistakes to generate real information is the stuff of wishful thinking, not science.” In everyday experience, information never arises without an intelligent source. 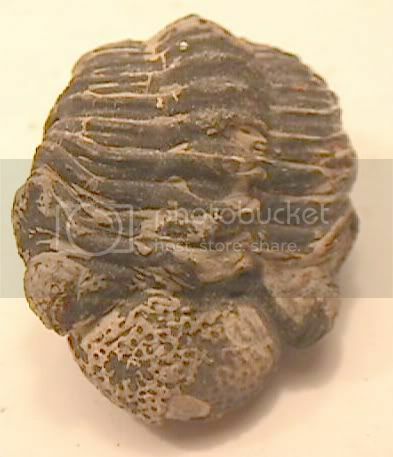 on the next installment I'll discuss fossils..
A fossil is an imprint, or impression of an animal or a plant that has been preserved in the earth. Usually a fossil is either the skeleton of the impression a skeleton of a dead animal preserved or molded into hard rock. Did you ever play with clay or play-dough when you were a child? I did. I remember I used to press objects into the play-dough and make an impression of it. This is possible because the clay is moist and pliable. That’s somewhat the same way fossils form. It is generally agreed that fossils form when the animal is suddenly buried in sediments or soil at or soon after death. Animals which died on the ground or surface water would quickly become a menu item and would be greedily eaten up… no animal, no fossil. 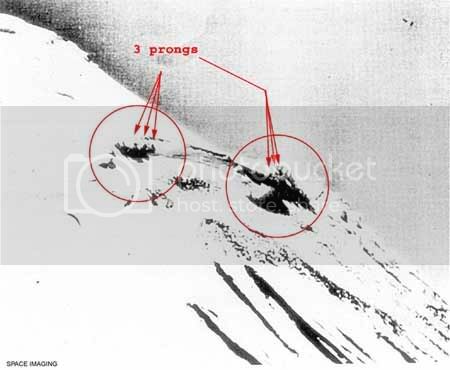 Recently, I watched a program about Mount Vesuvious.. On the morning of the 24 of August 72 AD Pressure finally blew out the plug. Two thousand people died within the town of Pompeii, many more scattered on the countrysides trying to flee. Pompeii was buried under 3 to 5 meters of pumice and ash. Herculaneum had it worse; being buried under thirteen meters of boiling mud that came pouring down the mountain in waves. Archaeologists discovered that many people were actually fossilized by the hot ash, and today, there are dozens of human fossils at the site. Excavators found that much of what Pompeii looked like in 79 A.D. had been preserved by the ash that had fallen. A bakery oven contained loaves of bread nearly 2000 years old! 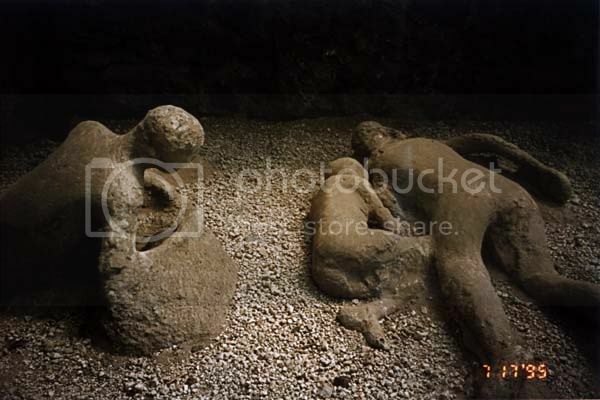 Victims of Vesuvius were immortalized when their decomposed bodies left cavities in the hardened ash. The cavities were filled with plaster to recreate victims much as they looked at the time of their death. A common form of fossilization is permineralization. Petrification occurs when the organic matter is completely replaced by minerals and the fossil is turned to stone. This generally occurs by filling the pores of the tissue, and inter and intra cellular spaces with minerals, then dissolving the organic matter and replacing it with minerals. This method reproduces the original tissue in every detail. This kind of fossilization occurs in both hard and soft tissues. 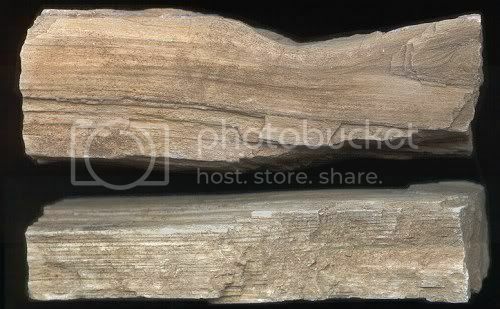 An example of this kind of fossilization is petrified wood. Some 3 million years ago, a volcanic eruption near the northern Napa Valley sent a thick cloud of hot ash and gas over the surrounding redwood forest. The buried wood was carefully and completely replaced by silica minerals leached from the rhyolitic lava. As the land changed and streams eroded into the ash beds, the petrified trunks and fossil wood fragments emerged, and the early settlers turned the site into a roadside attraction called the Sonoma Petrified Forest. Robert Louis Stevenson wrote about it in 1880, and it's still a low-key, woodsy place full of 19th-century charm. 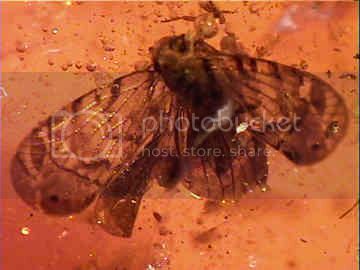 Unaltered preservation like insects or plant parts trapped in amber, a hardened form of tree sap. 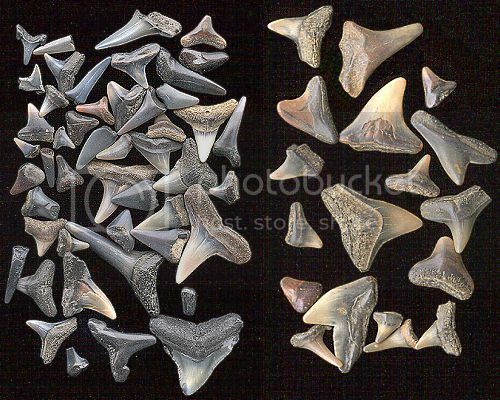 Some fossils such as these shark teeth have remained as they were when they were lost. An object doesn’t have to be petrified to be considered a fossil, merely preserved. The teeth on the left are modern, the teeth on the right are fossils. OK, I think that’s a fair description of fossils and how they are formed. Next, I’ll go into the fossil record. The fakes, the dishonesty, the assumptions, and finally the truth. Before I get into the fossil frauds and facts, I'd like to make the point that many Bible believing Christians already know. We believe that God caused a world wide flood in order to wipe out the corruption that had taken hold on the earth. I won't go into details about the corruption, as that would be another Bible study. I will focus on the facts surrounding the flood, and show that the fossils which we see in our museums and magazines were created by God's flood. I have given a somewhat boring description of how fossils are formed in order to show how well it fits in with the Bible account of a global flood. Gen 6:9 These [are] the generations of Noah: Noah was a just man [and] perfect in his generations, [and] Noah walked with God. Gen 6:15 And this [is the fashion] which thou shalt make it [of]: The length of the ark [shall be] three hundred cubits, the breadth of it fifty cubits, and the height of it thirty cubits. Gen 6:16 A window shalt thou make to the ark, and in a cubit shalt thou finish it above; and the door of the ark shalt thou set in the side thereof; [with] lower, second, and third [stories] shalt thou make it. Gen 6:17 And, behold, I, even I, do bring a flood of waters upon the earth, to destroy all flesh, wherein [is] the breath of life, from under heaven; [and] every thing that [is] in the earth shall die. Gen 6:19 And of every living thing of all flesh, two of every [sort] shalt thou bring into the ark, to keep [them] alive with thee; they shall be male and female. Gen 6:20 Of fowls after their kind, and of cattle after their kind, of every creeping thing of the earth after his kind, two of every [sort] shall come unto thee, to keep [them] alive. Gen 6:21 And take thou unto thee of all food that is eaten, and thou shalt gather [it] to thee; and it shall be for food for thee, and for them. Gen 7:5 And Noah did according unto all that the LORD commanded him. Gen 7:6 And Noah [was] six hundred years old when the flood of waters was upon the earth. view of what is simply called "the Ararat Anomaly" Noah's ark? 200 million fossil specimens have been catalogued of over 250,000 fossil species, and yet with all these fossils there isn’t a single series of graduated transitional fossils which track one species mutating into another, anywhere to be found. If living things have really evolved from other kinds of creatures, then there should be thousands upon thousands of intermediate or transitional forms of creatures, with “half-way” structures in our universities and museums throughout the world…but there isn’t – why do you suppose that is? On the other hand, if God created each species after their own kind, as He says He did, the fossil record should show creatures appearing abruptly and fully formed – which is exactly what is found to be true. Evolutionists have a disturbing track record of dishonesty and outright fraud when it comes to presenting evidence of so called “transitional” fossils. If the theory of evolution is really as solid and factual as they have dogmatically stated it is, then why do we see so many examples of fraud and misrepresentation of the evidence coming out of their camp? One commonly used transitional form is the Ambulocetus natans (“walking whale that swims”), discovered recently. It is believed that whales evolved from some form of land mammal, and that the Ambulocetus natans is transitional between the two, with halfway structures between land mammal and whale. But when reconstructed fossil drawings of Ambulocetus natans are compared with the actual bones found, it is realized that the critical skeletal elements necessary to establish the transition from non-swimming land mammal to whale are missing! This is classic evolutionist behaviour! Find a partial fossil – get an artist to add in the many missing bones and viola… a transitional fossil!! Never mind the fact that the added bones have never, ever been found anywhere. Never mind the fact that we really have no clue as to what these missing bones may or may not have actually looked like…we need a transitional fossil, so we’ll invent one. Have a look at this picture to get an idea of the scope and depth of the dishonesty, which the evolutionary scientists actually stoop to. 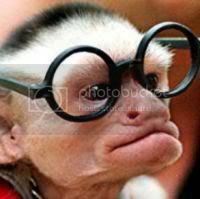 The media often sensationalize fossil “proofs” of evolution reported in scientific journals such as National Geographic. But when these journals later report disproofs of the same fossils, the media rarely mention it. For example, in 1996 there were headlines like “Feathered Fossil Proves Some Dinosaurs Evolved into Birds.” This was about a fossil called Sinosauropteryx prima. About a year later, four leading paleontologists, including Yale University’s John Ostrom, found that the “feathers” were not really feathers at all — they were just a parallel array of fibers. Another example is when the cover of Time magazine illustrated a dino-bird link with feathers, although not the slightest trace of feathers had actually been found! Found in a gravel pit in Sussex England in 1912, this fossil was considered by some sources to be the second most important fossil proving the evolution of man—until it was found to be a complete forgery 41 years later. The skull was found to be of modern age. The fragments had been chemically stained to give the appearance of age, and the teeth had been filed down! Found in the southern Spanish town of Orce in 1982, and hailed as the oldest fossilized human remains ever found in Europe. One year later officials admitted the skull fragment was not human but probably came from a 4 month old donkey. Scientists had said the skull belonged to a 17 year old man who lived 900,000 to 1.6 million years ago, and even had very detail drawings done to represent what he would have looked like. The first Neanderthal remains were found in France in 1908. Considered to be ignorant, ape-like, stooped and knuckle-dragging, much of the evidence now suggests that Neanderthal was just as human as us, and his stooped appearance was because of arthritis and rickets. Neanderthals are now recognized as skilled hunters, believers in an after-life, and even skilled surgeons, as seen in one skeleton whose withered right arm had been amputated above the elbow. Initially discovered by Dutchman Eugene Dubois in 1891, all that was found of this claimed originator of humans was a skullcap, three teeth and a femur. The femur was found 50 feet away from the original skullcap a full year later. For almost 30 years Dubois downplayed the Wadjak skulls (two undoubtedly human skulls found very close to his "missing link"). was widely recognized as a direct ancestor of humans. It is now established that he was merely an extinct type of orangutan. has been considered a missing link for years. However, studies of the inner ear, skulls and bones have shown that she was merely a pygmy chimpanzee that walked a bit more upright than some other apes. She was not on her way to becoming human. I have given just a few examples of fradulent representations of proof for evolution by the evolutionists. Ask yourself this question...why would they have to lie if they were correct? Now ask this question...How many examples has there been of any dishonesty or fraudulent information from the Bible? I'll tell you - none, not a single example. Of all the Bible critics throughout the planet, none have been able to point out even a single example of fraud or dishonesty from the Bible - not even a mistake in any geografical or historical description can be found. So who are you going to trust? The evolutionary scientists, or the Holy Bible? A living Fossil is an animal that was once known only by its fossilized bones. They were believed to have been extinct for millions of years. But then, to the embarrassment of evolutionary scientists, these animals were later found to be alive in remote parts of the world. Many of these animals had previously been used as "proof" of evolution. The okapi was once thought to have been extinct until they were found still living. These animals were once used as evidence that the horse had evolved. The original discovery of the Coelacanth in 1938 is still considered to be the zoological find of the century. This 'living fossil' comes from a lineage of fishes that was thought to have been extinct since the time of the dinosaurs. Before 1938 they were believed to have become extinct approximately 80 million years ago, after mysteriously disappearing from the fossil record. How could the Coelacanth disappear for over 80 million years and then turn up alive and well in the twentieth century? The Coelacanth (see-lah-kanth) is a fish caught in South Africa in 1939 off the coast of Madagascar. These fish were thought to have been extinct for 70 million years. In the 70 million years that it is said to have been extinct, and was used in evolutionary textbooks as a perfect example of a transitional fossil. And yet here it is and it has not changed or evolved at all ! The coelacanth was what they call an "index fossil". This means that whenever they found fossils of other animals in the same layer as the coelacanth, they "automatically knew" that it too was 70 million years old. Salamanders - A recent fossil find in China has pushed back the origins of Salamanders to 150 mya. The shocking discovery is that the salamanders are virtually unchanged from what we find living today in the neighborhood swamp. Here's a quote from Ken Gao from the American Museum of Natural History, a scientist on the scene. "For the last 150 million years not much has changed". Wollemi Pine also known as the "Dinosaur Tree" - These pine trees were discovered in Australia in 1994. The genus of these trees coexisted with the dinosaurs about 150 million years ago. Neopilina mollusks - Discovered living in the early 1950s these mollusks share a close relationship with fossils that existed about 400 to 500 million years ago. Tuatara "Lizard" - This reptile is on the verge of becoming extinct in New Zealand. It's the only survivor of a group of reptiles named Sphenodontia and has not changed in over 200 million years. Ginkgo Tree - Yes this herbal source is on the list too. The Ginkgo tree belongs to the family Ginkgoaceae which date back to 270 million years. They were thought to be extinct until they were discovered in 1691 in the Japan. Another interesting point to note is that they were featured in the movie Jurassic Park. Alligator - They are members of the crocodile family and it's basic type can be traced back 230 million years. Horseshoe Crab - This annoyance to many fisherman can be traced back about 300 million years when their ancestors ruled the oceans. Army Ants - In year 2003 a Cornell entomologist discovered that these ants have remained unchanged for the last 100 million years. Green sturgeon - This seven foot long fish has remain unchanged for 250 million years. Hummingbirds - Some modern hummingbirds share a remarkable resemblance to those found in the fossil record 30 million years ago. 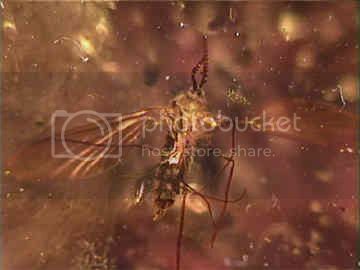 Lice have been found to have maintained stasis for at least 44 million years. Cicadas - These loud buzzing insects have been around for at least 150 million years. Nautiluses - These slow moving Cephalopods have been around for at least 500 million years. Cockroaches - These very unpopular pests have been around for at least 300 million years. Velvet Worms - These amazing little creatures have remained largely unchanged for 500 million years. Cycads - These odd looking plants have persisted for about 200 million years. Emperor dragonflies - For 230 million years, these fast flying insects have remained largely unchanged. Lungfish - These interesting creatures have the ability to breathe in water that is very poor in oxygen. They have inhabited the earth for 350 million years. White-flag Dolphins - These rare freshwater dolphins have remained unchanged for 25-30 million years. Leatherback Turtles - This endangered species may not be on the "living fossils" list for long. They have remained unchanged for 65 to 100 million years. If turtles leave “more and better fossil remains than do other vertebrates” but transitional forms are “entirely lacking,” what can this say for intermediates between all other vertebrates? Colymbosathon ecplecticos - This crustacean has been described as a case of "a striking example of evolution almost standing still." It hasn't changed in 425 million years. Nightcap Oak - This plant extends back 70-120 million years into the fossil record. Butterflies - One research said that "it's no different than if you took a modern day butterfly and put it under a light microscope." They have been similar for 40-50 million years. Ferns - Although there has been some variation within this group, this general type has existed for more than 300 million years. The reality is that the fossil record seems to fit the creation model well — the record shows abrupt appearances of fully formed organisms, with large systematic gaps (lacking transitional forms) between different types of creatures. Even the evolutionists are frustrated in the total lack of fossil evidence which would corroborate their "theory"
The most commonly used radiometric dating methods are potassium-argon, uranium-lead, and rubidium-strontium. The concept of how these methods work is simple: one element decays into another at a predictable rate. Potassium decays and becomes argon. Uranium decays into lead. And rubidium decays into strontium. All three of these decay processes have half-lives measured in billions of years. Half-life is simply the time required for half of the atoms in a pound of uranium, for example, to disintegrate into lead. That time is approximately 4.5 billion years. What the initial amount of the parent atoms was at the time that the rock formed. That the original composition of the rock contained no daughter atoms. That neither parent nor daughter atoms have ever been added or removed from the rock. That the decay rate of parent atom to daughter atom has always remained constant. If these assumptions are correct, then the radiometric dates are correct. However, there is no way to independently test these assumptions. If they are wrong, the method could yield faulty dates that might be far too old. Here‘s an example: suppose there is a burning candle sitting on the table. How long has that candle been burning? This can be calculated if the candle’s burn rate and original length is known. However, if the original length is not known, or if it cannot be verified that the burning rate has been constant, it is impossible to tell for sure how long the candle was burning. A similar problem occurs with radiometric dating of rocks. Since the initial physical state of the rock is unknowable, the age can only be estimated according to certain assumptions. When dating a rock, the geochronologist (scientist who performs the dating procedure) must first assume the rock’s age before it is dated. For example, if a scientist believes a piece of rock is 4.5 billion years old, he or she may then use the uranium-lead dating method because it has a half-life of about 4.5 billion years. This involves circular reasoning, as is clearly evident in the article on dating in the Encyclopaedia Britannica: “Most geologists must rely on geochronologists for their results. In turn, the geochronologist relies on the geologist for relative ages.” The geochronologist must also be sure that the rate of decay, from uranium to lead for example, has remained constant in the rock over the past 4.5 billion years. Furthermore, the amount of uranium in the rock that was present to begin with must also be assumed. And neither uranium nor lead can have ever been added or removed from the specimen by any natural circumstances, catastrophic or otherwise. If all of these assumptions are correct, then the resulting dates are correct. However if even one of these assumptions is wrong, then the resulting dates are erroneous. Why does radiometric dating repeatedly result in very old dates (such as billions of years)? While one explanation is that these dates show the specimens’ true age, another is that one or more of these large assumptions associated with this method of dating is wrong. Rock which was formed in 1986 from a lava dome at Mount St. Helens volcano was dated by the potassium-argon method as 0.35 ± 0.05 million years old! Rocks from five recent lava flows at Mount Ngauruhoe in New Zealand were dated using the potassium-argon method, and resulted in dates ranging from <0.27 to 3.5 million years — but one lava flow occurred in 1949, three in 1954, and one in 1975!! HELLO?! Salt Lake Crater on Oahu was determined to be 92–147 million years, 140–680 million years, 930–1,580 million years, 1,230–1,960 million years, 1,290–2,050 million years, and 1,360–1,900 years old, using different radiometric dating methods. How did 1,000-year-old carbon-dated trees in the Auckland volcanic field of New Zealand get buried under 145,000-465,000 year old potassium-argon-dated lava rock? But if excess argon can cause exaggerated dates for rocks of known age, then why should this dating method be trusted for rocks of unknown age? If the earth was located only slightly farther away from the sun, it would freeze like the planet Mars. If it was only slightly closer, it would burn up in heat like the 860°F temperature on Venus. If the earth did not revolve regularly on its axis, half of the planet would be in permanent darkness without vegetation. Meanwhile, the other side of the planet would be an uninhabitable desert, suffering from the overwhelming heat of permanent exposure to the sun. If the Earth were not tilted at 23°, it would not have the seasonal variation that produces the abundance of crops that feed the planet’s huge population. Without this tilt, less than half of the present land used for cultivation of crops would grow vegetables. If the earth was only a small percentage smaller, the reduced gravity would be incapable of holding the atmosphere that is essential for breathing. If the planet Earth was twice as large, the effect of increased gravity would make everything on the planet’s surface weigh eight times what it weighs today. This increased weight would destroy many forms of animal and human life. A much thinner atmosphere would provide no protection from the 25,000 meteors that burn up over the earth every day. A thinner atmosphere would also be incapable of retaining the higher temperatures required for the existence of human and animal life. If the atmosphere were not 78 percent nitrogen and 22 percent oxygen and other gases, breathing would be impossible. If nuclear forces were decreased by only a few percent, the particles of the universe could not have come together in nuclear reactions to make the ingredients from which life must be constructed (such as carbon atoms). If the combined masses of the proton and electron were a little more rather than a little less than the mass of the neutron, the effect would be devastating. The hydrogen atom would become unstable. Throughout the universe, all the hydrogen atoms would immediately break down to form neutrons and neutrinos. Robbed of its nuclear fuel, the sun would fade and collapse. Across the whole of space, stars like the sun would contract in their billions, releasing a deadly flood of x-rays as they burned out. By that time, life on earth, needless to say, would already have been extinguished. The book Stephen Hawking’s Universe concludes that the odds against the accidental formation of a universe such as this would be comparable to shaking the parts of a watch in a barrel and having them fall into place as a working timepiece. What implications could these incredible probabilities entail? Well, if one can determine how unlikely it is that a given pattern can arise by chance, one has his or her answer as to how likely it is that the structure is deliberate. Suppose you find a quarter lying on the street. Without a moment’s thought, you assume that someone dropped it accidentally — that it’s there “by chance.” You assume this because it’s so commonplace an occurrence. After all, consider the alternative: that someone placed it there deliberately. Though it’s theoretically possible, your own personal experience tells you that it’s pretty unlikely. Now, what if you found three quarters, all close to one another? Still, it seems more likely that someone dropped a cluster of coins by accident, than that the person put them there. (Maybe you feel it’s a close call.) Part of this calculation (which is less certain than the prior one) involves something else, too: a reasonable guess about people’s reasons for doing things. It’s hard to think of a good reason for someone putting three quarters on the ground deliberately. Let’s take it one step further. Suppose you again find three quarters, but this time they are all touching one another, forming a triangular arrangement. Was this deliberate, or by chance? Chance certainly can’t be ruled out, but it seems “suspicious.” It’s now likely that you’ll change your mind and think that someone did it “on purpose” — even though the purpose is hard to imagine. Finally, what if you find ten quarters stacked neatly one on top of another? Though once again you can’t prove it didn’t “just happen,” the odds against it will seem so great (It’s so odd, you’ll think) that you’ll be certain the stack was placed there for some unknown reason. My friends - brother’s and sisters in Jesus. In presenting the facts of creation vs. evolution, I am in fact submitting that God/Jesus created everything. Not only that, but he created it in seven literal days, as Genesis clearly states. As we all know, there are many atheists who contend that there is no God, and everything came into being without any intelligent direction whatsoever, through a series of fluke, random, accidents. That position is so completely unimaginable, as to be ludicrous! The contention that all matter - planets - suns - dark matter - black holes - normal space - life etc, were initially confined to a space the size of a pinhead, (where that came from is another enigma wrapped inside a mystery) and “somehow” a mysterious explosion caused the “material” on that pinhead to become everything that exists today, is utterly impossible to take seriously! What did all matter expand into? Remember, there was no space for this matter to even expand into in the first place! What caused the explosion? When’s the last time anyone created life by detonating a bomb? Evolutionary scientists have many of us completely convinced that these far-fetched explanations are factual! They are not! Think about it. How could anyone test these theories? How could anyone know what was or was not in existence before this theoretical “big bang”? Evolutionary scientists have many of us believing that the age of the universe is positively known to be many billions of years old! This is not true my friends! How can science know the age of the universe? Light years are not a measure of time, they measure distance. It’s like saying a store is four miles from your home, and therefore the store is five minutes away. That’s fair enough, but is it five minutes to walk? Or run? How long would it take to drive a car? What about a sports car? How long if you take a train? What about a jetliner? See where I’m going? Science can “estimate” up to a certain distance, it can not, and will never be able to calculate the age of the universe. A light year is a measurement of distance only—the distance light can travel through a vacuum in a year (9.5 x 10 to the power of 12 km)—not a measure of time. It requires a number of assumptions to claim that large distances mean a great age of the universe. So as Christians, we don’t have to deny the great distances of the heavenly bodies to believe in a young earth and universe. We can question, in fact challenge the “theories” which evolutionary scientists arrive at by looking for specific answers which fit in with their pre-supposition that there is no God. What’s even more disturbing than the fact that so many of us have been indoctrinated in this “theoretic”- “factual” science, is that many Christians cross the line between what God says and what secular science says in regards to creation/evolution. Many Christians have swallowed the bait and are forced to disregard the Genesis account as “myth” I mean after all, evolutionary scientists have all the facts…right? We must understand the reality of this “theoretical” science my friends - we can not have it both ways. We either believe God’s Word or we don’t. If we doubt the very first book of the Bible, then what of the rest of it? Is any of the rest of the Bible “myth” also? Sadly, for many Christians, the answer is yes. There are Christian ministries which ascribe to the billions of years old earth. This is called ‘progressive creationism’ They believe that there were human-like beings before Adam who never had a soul and could not be saved by Christ. They believe that there were dinosaurs and other creatures on earth millions of years before Adam and Eve - They believe the ‘Big Bang’ origin of the universe occurred 16-billion-years ago; that death, bloodshed, and disease existed before Adam & Eve. This view made necessary by their acceptance of evolutionary long-age dating methods. These Christians believe that God created the heavens and the earth over billions of years - that the earth and life on earth was created in six “time periods”, instead of six literal days, as the Genesis account describes. As Bible believing Christians, we should understand that the Bible declares that the earth is about six thousand years old. We can be confident of this age because the incredible accuracy of Biblical genealogies. This is an incredible claim, especially when God had created a perfect world at the beginning - all the animals and man were vegetarians (Gen. 1:29). Plants were given for food - they do not have a ‘nephesh’ (life spirit) as man and animals do. God killed the first animal in the Garden and shed blood because of sin—if there was death, bloodshed, disease and suffering before sin, then the basis for the atonement is destroyed. Christ suffered death, for death was the penalty for sin. There will be no death or suffering in the perfect ‘restoration’—so why can’t we accept the same in a perfect (‘very good’) Creation before sin? Next, I will discuss dinosaurs in the Bible, and the Flood.